Rev. Can. 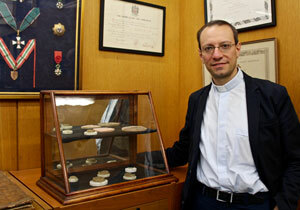 Dr. Federico Gallo, next to a sampling of replicas of medieval seals from Astrik L. Gabriel’s personal collection. Canon Gabriel was director of the Institute from 1952-75; his collected books, microfilms, and other materials on the history of medieval universities form the Astrik L. Gabriel Universities Collection, housed in the Institute (715E). The Medieval Institute was pleased to welcome again guest speaker Reverend Canon Doctor Federico Gallo, director of the Biblioteca Ambrosiana (Milan), following his lectures in 2013 and 2015. On Thursday evening, June 30th, Gallo gave an enlightening lecture entitled “On Diplomatics: The Science of Reading Medieval Documents.” He defined diplomatics as the study of ancient and medieval documents, particularly those meant to attest a legal act. (Gallo likened such documents to the modern cash register receipt, to demonstrate that diplomatics are concerned with form and function rather than the literary.) In the first part of his lecture, he reviewed the discipline of diplomatics, which originated in the seventeenth century, and differentiated between its theory and practice in the English language critical tradition and in that of continental Europe. Finally, Gallo described and illustrated the primary components of a document, including the protocollum, textus, and escatocollum. He further considered the different study of public versus private documents, together with their external and internal characteristics. Gallo concluded his lecture by examining the conservation of medieval documents at the Biblioteca Ambrosiana. The Institute has a long-standing relationship with the Biblioteca Ambrosiana and invites you to visit its extensive collection of microfilms and other materials that reproduce the holdings of that library here at Notre Dame. For more information, contact the Institute’s librarian, Dr. Julia Schneider. Originally published by Erica Sestak at medieval.nd.edu on July 13, 2016.